America is in the midst of a major clash of two cultures. Most of the rich world, and the developing world as well, are experiencing the same challenge. This contest is seldom cooperative, often violent, and increasingly heated. It has the passion of the age-old class debate between the rich and the middle classes, the political angst of Republican versus Democrat, or the intensity of Cold War America versus the Soviet Union. It is much more obsessive than raging sports rivalries which so many Americans have experienced. This conflict is intellectual in nature, though its results are physical, economic and substantive. There have been such intellectual battles before, such as conservatism versus liberalism. But, given human nature, the conservative-progressive debate seldom gained the zeal or ardor of Democratic fights with Republicans. Somehow having professionals who make their living promoting each opposing side drastically intensifies the natural belligerence of skirmishing viewpoints. In fact, it has been intellectual wars that caused the greatest conflicts of history—from strife between religions to capitalism versus communism. The sides of this new war are conformity and innovation. This may at first sound less hostile than some struggles, but it would be a mistake to underestimate this issue. It is remaking the world as we know it. Of course, those who support conformity have been around for a long time. And innovation has always been a rowdy, if lucrative, minority movement. Ironically, the leaders of conformity have typically come from the upper classes—nearly all of whose wealth, family legacy, and status was created by one or more ancestral innovator(s). Innovation breeds growth, wealth, success and status. The old parable of the tree house, as told to me by a partner of a major Los Angeles law firm, is applicable: build the tree house, then kick out the ladder so only those you personally select can ever come up. Of course, the extreme of either side is—as extremes tend to be—worse than the moderate of either. Pure innovation with no regard for the lessons of history is just as bad as dogmatic conformity without openness, toleration or creativity. When I speak here of Innovation I mean a bent toward innovation within the proven rules of happiness and wisdom, and by Conformity I mean a focus on fitting in but with some open-mindedness in times of challenge. Note that even these two moderate styles are almost polar opposites. Nearly all of our schools have a hidden, compulsory curriculum of training for conformity, and innovative teachers or institutions are pressured to become like the rest or face widespread official rebuke. The classic movie Dead Poet’s Society portrays this well. Our universities follow this pattern more often than not, as do most institutions in our society. Entrepreneurship, for example, which is the catalyst of nearly all great business growth, is considered “lesser” by most business students and MBA programs. Many great companies were founded and built by individuals whose resumes would not get past the first glance in personnel departments of those same corporations today. And, indeed, the company’s biggest competitors are likely to be led by innovative thinkers and leaders who likewise wouldn’t get a job at the company (too many Ivy League MBA’s to compete with). Such rigid thinking is a symptom of the widespread doctrine of conformity. It rules in many families, communities, businesses, schools, churches, nations, associations—indeed, almost everywhere. It is, in fact, on the throne in nearly every setting and society. It has the benefit of learning from the best lessons of the past, but it seems to chronically ignore the lesson that innovation is both advantageous and desired. Futurist Alvin Toffler argued that our schools will not be competitive in the world economy unless we replace rote memorization, fitting in, and getting the “right” answer with things like independent thinking, leadership practice, creativity and entrepreneurialism. Several of Harvard’s educational scholars and Secretary of Education Arne Duncan have made the same point—repeatedly. But our schools are run on conformity, and until we promote innovators to educational leadership such changes will be rare. And when we do put innovators in charge, the attacks from entrenched powers are incessant. Likewise, our economic experts are those who conform to the “accepted” analyses—economists with divergent, and often more accurate, predictions based on innovative models are given little press by the conformist economics, academic and media professions. I have long suggested that the way to fix American education is to get truly great teachers in more of our classrooms. But innovative teachers often don’t fit in the bureaucratic school systems. Many of the best teachers leave schools simply because they can’t innovate in a conformist system. This seems indicative of our entire culture right now. Conformity is winning far too often. Companies and organizations which elect to encourage the innovative side of the debate are seeing huge success, but this is taking many of the “best and brightest” away from academia, the public sector and the United States to more entrepreneurial-minded environments in private companies and international firms. In far too many cases, we kill the human spirit with rules of bureaucratic conformity and then lament the lack of creativity, innovation, initiative and growth. We are angry with companies that take their jobs abroad, but refuse to become the kind of employees that would guarantee their stay. We beg our political leaders to fix things, but don’t take initiative to build entrepreneurial solutions that are profitable and impactful. The future belongs to those who buck these trends. These are the innovators, the entrepreneurs, the creators, what Chris Brady has called the Rascals. We need more of them. Of course, not every innovation works and not every entrepreneur succeeds, but without more of them our society will surely decline. Listening to some politicians in Washington, from both parties, it would appear we are on the verge of a new era of conformity! “Better regulations will fix everything,” they affirm. The opposite is true. Unless we create and embrace a new era of innovation, we will watch American power decline along with numbers of people employed and the prosperity of our middle and lower classes. So next time your son, daughter, employee or colleague comes to you with an exciting idea or innovation, bite your tongue before you snap them back to conformity. The future of our freedom and prosperity depends on innovative thinking, and the innovation we need may be in the mind of your fifteen-year-old son or your husband, wife or employee. This battle will ultimately be fought in families, where youth get their fundamental cultural leaning—toward either conformity, seeking popularity and impressing others or, in contrast, creativity, initiative, and innovation. Thomas Jefferson Education is naturally pointed toward innovation, but it is up to parents, mentors and teachers to implement this leadership skill. I invite all to join this battle, and to join it firmly committed to the side of innovation. Do whatever you can to encourage innovation and be skeptical of rote conformity. That’s a change that could literally change everything. For the last two years the story in Washington has been the same: “President Bush got the U.S. into the worst economic downturn since The Great Depression, and the Obama Administration has been hard at work pulling our economy back from the brink of another collapse.” This storyline has provided the background for President Obama’s numerous policy proposals, most notably the huge government stimulus bailouts, the health care law, and a chilly attitude in Washington toward business. The plotline changed in the November election of 2010, though it took a while for everyone to realize the full significance of this shift. The White House has reluctantly followed the Republican script in refusing to raise taxes so far, and Republican proposals for balancing the budget and dealing effectively with the national debt have fueled rebound plans from leading Democrats—including from the Obama team. During all this, a major alteration has occurred in the American psyche: Obama, not Bush, now “owns” the economy in the popular mind. If the slow recovery of jobs and growth turns into real recovery, President Obama will get the credit. Republicans will argue that it was their anti-tax-raising and pro-business work that got the economy flourishing again, but only Republicans will listen. Democrats and the majority of independents will see lasting economic recovery as an Obama victory. If, on the other hand, the economy continues to sputter or dips again, if unemployment stagnates or rises, Obama will get the blame. Most Democrats will likely still see the policies of the Bush era as the problem, and most Republicans will find ways to blame President Obama regardless of what happens, but the majority of independents have moved past blaming Bush. Right here, right now, as most independents see things, it is up to the Obama Administration to steer the economy in the right direction, and independents will hold him to this responsibility. They won’t blame Bush anymore, and they won’t blame the new Republican majority in the House. If the economy booms, they’ll reward Obama; if it contracts, they’ll blame Obama. It’s now Obama’s economy. That’s Big Political Trend Number 1. Number 2, to be clear, is that independents now determine presidential elections. Big Political Trend Number 3 is that we are likely to see inflation ravage the economy in the months ahead. [i] In fact, this third trend has the most potential to significantly impact and hurt most Americans. A Fourth Big Trend is that China is losing faith in the U.S. dollar and is looking to diversify its portfolio—meaning that it will likely stop buying as many U.S. bonds as it has and this will drastically hurt our economy. [ii] All of this is exacerbated by rising oil prices and the downgrading of the S&P rating of U.S. securities from Stable to Negative. This doesn’t mean that a down economy will necessarily drive Obama out of office, however. Such an outcome will depend on who the Republicans nominate for the presidency. When the general election arrives in November 2012, most Democrats will probably vote for Barack Obama and most Republicans will likely vote for the Republican candidate. Independents will vote for…well…it depends. If the Republican nominee is mainly a social conservative, most independents may well vote for Obama regardless of how the economy is doing. Since many of the Republicans who left the party to become independents in the last decade are most interested in economic issues, the relative strength of the social conservatives in the GOP has grown and social conservatives may emphasize social issues in the primaries and at the national convention. The Democratic Party faces its own challenges due to losses to independents, but it is almost sure to nominate President Obama. In short, it is not unlikely that Republican Party loyalists will appoint a presidential nominee who won’t appeal to most independent voters. If, on the other hand, Republicans nominate an economic powerhouse who appeals to independent views on economic issues and can compete with Barack Obama on the tricky ground sometimes referred to as “the leadership thing,” the election of 2012 could be a close race. A Republican could win, or President Obama could win. It is unclear if any of the current Republican field could be such a powerhouse. There are several Republicans who might make the case to independents for leadership and economic wisdom, and let’s not forget that someone new could arise—at this point in the last presidential election cycle most people in America had never heard of Barack Obama, and Hillary Clinton was expected to be the obvious Democratic candidate. To date, however, no potential 2012 Republican presidential candidate has caught on with independents—or seems poised to do so. Regardless of what Republicans do, or don’t do—in the various policy debates of 2011 and 2012 and also in the 2012 election—a bad economy will probably convince most independents to lean away from voting for Obama. But only if the right kind of Republican is in the race. The larger point in all of this, a point which many Democrats and Republicans haven’t yet noticed, is that even in a bad economy most independents would still vote for Barack Obama over, say, Richard Nixon, Gerald Ford, George H.W. Bush or George W. Bush. Obama has lessened the gap between himself and Bush by basically following the Bush agenda in Afghanistan, Iraq and Guantanamo. He has failed to implement his various campaign promises about these areas and he has significantly increased the number of troops in Afghanistan. “Bush or Obama? What’s the difference?” many are wondering. In domestic policy, the differences are glaring—if you are a Republican or Democrat. Bush supported business and the free market, some conservatives argue, while liberals point out that Obama has significantly helped the most vulnerable and weak among us. Independents, however, are underwhelmed by either argument. In their view, Bush gave lip service to the free market while drastically increasing government spending above President Clinton’s levels, and all of Obama’s rhetoric about helping the “little guy” has led to more government spending on programs that arguably have done little to actually help the needy or anyone else. Both administrations, as seen from the independent view, have done much harm to our economy and nation. The stimulus package and health care law are unpopular among independents, but not as unpopular as the corruption of Bush’s administration (from various “witch hunts” and investigations of political opponents to no WMDs in Iraq). Obama talks like a liberal, spends like a liberal, and leads like a liberal, according to the independent perspective, but Bush spoke like a conservative and then led and spent like a liberal. Independents are thus understandably skeptical of Republican candidates promising to be fiscally responsible. “At least with Obama, we know what to expect,” is a common independent refrain. A Republican nominee will have to convince independents that he or she will exhibit truly great leadership and economic wisdom, while President Obama must simply convince independents that the Republican candidate won’t do any better than a second-term Obama. The common political wisdom is that with a bad economy the sitting president suffers in a national election. In 2012, a bad economy will be seen as “Obama’s bad economy.” But unless Republicans nominate a presidential candidate who can appeal widely to independents on both economic and leadership issues (especially in the battleground states), “Obama’s economy” will likely last until 2016. Why are We Still in Recession? The Wisdom of Crowds or Crowns? There is a technical definition of economic “recession,” but many Americans don’t know exactly what it is. Nor do they accept the experts’ assurances that the Great Recession is really over. Indeed, in the view of many, it was the experts who led us into recession while predicting something else. The same experts promised that stimulus would fix things, and now they continue to confidently promise and predict as if their record should somehow bolter our trust. In many ways, America’s elites consider regular Americans uninformed and ignorant. But there is another kind of wisdom, not based on expertise and therefore seldom understood by the elite class (most of whom were convinced some time before or during college that erudition is a matter of credentials, titles and peer consensus). The “other” wisdom is based on an innate or experiential understanding of principles, of knowing things like these: Increased government size and spending is out of control; and like the housing bubble, the big-government bubble will have to burst at some point. In the governmental model as erected by the American Founders, the wisdom of the masses is a critical and even central feature of republican government. The American founders so trusted this type of wisdom above that of experts that they put the regular citizens in charge of elections and our direct representatives in charge of the nation’s purse strings. They also gave the federal government only 20 specific powers and left the rest to the states and people. Many, especially the upper classes of Europe, argued that such an arrangement could not succeed, that nations must be led by elites and their specialized agents. History proved the Founders correct in this debate. There is also another kind of “recession” not defined by economists but very real nonetheless — a recession where most people feel deep and overwhelming economic anxiety, where few families have as much money now as three years ago but more expenses, and where the majority feels deep down that things will get worse before they get better. This kind of recession doesn’t move charts or graphs, but it does operate on a real logic: When the experts are wrong over and over, stop following them. It should be noted that the people who use this type of reasoning generally have great respect for expertise and the experts, but not a blind faith. Such wisdom holds that if individuals, households and businesses must tighten their belts, live within their means, and rise to a more self-reliant and entrepreneurial approach now that times are hard, the government needs to do the same. If Washington refuses such common sense, it is deluding itself — and forcing us to pay the bill. This “other” wisdom realizes that we have lived beyond our means for some time, and that we can only really build a new model if the old system is deeply changed. The far Right and far Left argue that such progress can only come from the ashes or ruins of our broken system “after it falls,” while more moderate voices believe that a few fundamental shifts in worldview and policy can get us back on track. We can move from nanny state to free enterprise, according to this view, from big government to smaller and more effective government, from a nation of dependents to a nation of innovators. Such arguments sometimes sound untrained and unsophisticated to elite ears, partly because the privileged class wants America to look good to the European eye — but mainly because these type of arguments are often untrained and unsophisticated. But we should not make the mistake of considering them naïve or ineffectual. Sometimes the simple solution is best — especially when one of the most daunting problems is how complex our government and economy have become. Expecting any single expert or government official to have a full grasp of it all is truly unrealistic, and depending on large teams of specialized experts doesn’t work without leadership from those who grasp the entire reality and envision something better. Grassroots wisdom from the people as a mass accomplishes this more effectively than any party, politician or intellectual class. This is the linchpin of freedom. The citizens must truly lead, or freedom does not last. In times of crisis, wisdom is more important than expertise. Both are essential, but wisdom is most vital. The American people, however uninformed they may appear to elite tastes, have wisdom in spades. They make mistakes, as Jefferson and later Tocqueville put it, but they always correct them. One central reality stands out right now: People are struggling a lot more than the experts admit or the numbers show. The economy may be in a slow recovery, but the American people are stuck in recession. And they know it. Families and communities are experiencing more hurt than gets reported, and many people feel that things are getting worse. The middle-class standard of living is collapsing, and the worst of the housing bubble appears to still be ahead. Moreover, the government bubble is real and eventually it will burst. Unemployment is worse than the numbers show. For example, many of the job losses are in middle- and high-paying jobs while most new jobs are low-paying. With the real unemployment rate (which includes those who have given up even trying to find a job) over 12 percent and the underemployed rate above 18 percent, we are more than halfway to a depression (traditionally defined by 25 percent unemployment). Yet our leaders spend, borrow, and spend. The Chinese have continued to lend us more, as we figuratively hung ourselves and our posterity with an unyielding cord of debt. Washington regulates more roadblocks to business growth, and tells us that 10 percent unemployment is the new normal. Then politicians pile on more regulations that hinder global investment in the U.S. and send it to friendlier markets. American firms go abroad and find lower taxes, reduced regulatory environments, and more plentiful capital. As unemployment lingers in the wake of these policies, we are assured that more government programs will care for those without jobs. Most Americans find this more alarming than comforting. Consumers don’t spend. Businesses close. A drive down Main Street, Anywhere, USA is a museum tour of boarded-up windows. We elect one party’s leaders with high hopes, then we try the other party—back and forth, without lasting success. Things worsen. Inflation may follow, as the Fed prints more money and further devalues our currency. Many Americans feel the afterglow right after a major election, but the anxiety returns when the bills keep coming and they try to balance their checkbooks and plan for the years ahead. Call this recovery if you want, but the American people aren’t convinced. The good news is that when pushed the American people take note and take a stand. The great American entrepreneurial spirit is rising, and it is our only real hope. Elections come and go, but cultivating the values and skills of free enterprise in ourselves and others builds for the long term. It creates a solid foundation that works. The election of 2010 is over, and the elections of 2012, 2014, 2016 and beyond will not have near as much impact on America’s future as the entrepreneurial spirit (or the lack of it) among the mass of regular citizens. To the extent that elections help free the economy for growth, they can greatly benefit our prosperity and freedom. But ultimately America’s success and affluence will depend upon the initiative, innovation, creativity, tenacity, resiliency, ingenuity, enterprise and entrepreneurial spirit of the regular people. This is the true wisdom of crowds, and only the regular people can make this happen. China may rise in prominence and even to superpower status in the decades ahead. If so, it will do so by applying these very entrepreneurial traits. The same is true of India, Brazil, Europe, other places, and the United States. Our future depends on the rise of these entrepreneurial values and characteristics. The adoption of these will signal a true economic Recovery and put a real end to the Great Recession. Whatever the politicians, parties and experts say, the world of 2020, 2030 and 2040 will be a world of our making, and the nations which rise in prosperity, freedom and power will be those where the entrepreneurial spirit flourishes. With this in mind, I am convinced of at least two things: Our future is bright, and there is a lot of work ahead for all of us. And many Americans believe the economy will continue to decline. If it does, the Obama Administration has very few tools to respond. The White House has based its entire economic policy on an ideological belief in government spending and intervention, but further economic downturn will require it to take serious action. What can it do that it hasn’t already tried? How much more can it spend? And at what point will it accept that such spending isn’t delivering fixes to unemployment and the economy as promised? If the government increases spending, promotes more stimulus, raises taxes or increases regulations (or all of the above — which is what it has done so far), it will run into major difficulty. So far none of these have fixed the economy. The nation now ranks Democratic leaders at their lowest rating ever compared to Republicans (42 percent to 52 percent). And the major issues fueling dislike of the Obama agenda are unemployment (now 9.6 percent), the healthcare law and other increased government regulation, and massive government spending. Some economists, like Paul Krugman, say the problem is that the stimulus should have been much bigger in the first place — since now there is very little support for more government spending. The White House seems to agree, and it is preparing to raise taxes on big business. The problem with this strategy is that very few small businesses have a lot of extra cash right now. Big business, in contrast, has a lot more extra cash than the whole of government stimulus. Unfortunately, with the Obama Administration promising to end tax cuts to big business, these companies are unlikely to hire or spend their cash on hand. And if President Obama does raise taxes on big business, they are likely to simply hold their cash or spend it in other countries. A lot of corporations are seriously considering moving more of their operations abroad to find more favorable environments for profit. Many have already made this move, taking jobs and money with them. A lot of nations are using similar campaigns to lure investment, while the U.S. is actively adopting policies which drive capital away. Why would businesses that can afford to move stay in the U.S. to face more White House attacks and increasing taxes and regulations? This not only won’t help our economy. It will increase unemployment, make credit harder to obtain for small businesses, and convince consumers to buy less. In short, it will significantly hurt the economy. The Obama plan claims to help small business, but in fact its proposed policies will do the opposite. One Harvard economist points out that our debt load is now even worse than that of Greece, which has just experienced major economic collapse and is being bailed out by international banks. The impact on the elections is obvious. If a lot of Republicans win, they will have more influence to argue for more business-friendly policies. But there is no guarantee they will do so. After all, the Bush Administration significantly out-spent the Clinton Administration before it. No matter what happens in the election, the Obama team needs to take a different route if they want to reboot the economy. Two years into Ronald Reagan’s presidency, the economy was struggling and unemployment was above 10 percent. Reagan pushed to cut taxes, reduce government spending, and, perhaps most importantly, sent out the message — over and over — that government needed to be reduced and that private business was the hope of the economy. In retrospect, spending actually increased under Reagan, but his consistent message of promoting business, support for business growth and free enterprise, and the need to cut government and spending made business feel safe. He spoke optimistically of business on all levels, and lauded the opportunities provided by free enterprise and free markets. The result? Businesses hired and entrepreneurs went to work. Commerce soared. Growth quickly soared to 8 percent (the Obama “recovery” was around 1 percent) and unemployment rates came down. The 1980s became an era of economic boom, which grew into the roaring 1990s. Too often the opposite message is coming from Washington. The White House repeats its “unfriendly to business” message over and over, calling businessmen “fat cats” and telling young people to work for non-profits and not go into business. It constantly promotes increased government spending and ever-expanded regulations which drastically increase the cost to start and build businesses. It has publicly attacked the Chamber of Commerce, the ultimate small-business advocate, and in general it has sounded angry and dangerous to business. Now, in the name of “helping small business,” it is increasing taxes on big business and people who succeed in small business — many of those above the $200,000-$250,000 threshold are small entrepreneurs. And, as I said above, many big businesses which hold a lot of cash are making plans to take it abroad. These realities are a serious problem. Americans now believe Republicans (49 percent) “would do a better job of dealing with the economy than Democrats (38 percent).” But what exactly is the Republican plan? It is unclear. Americans seem to believe that at least Republicans will stop increasing taxes and regulations on business, and perhaps be a lot more friendly and welcoming to business. Perhaps the most significant reality is that Democrats and the Obama Administration now have a 60 percent disapproval rating among independents. Of course a lot of Republicans support Republican politicians and a lot of Democrats support Democrats. But President Obama was swept into office by independents, and now most of them no longer support his policies. Independents are mostly for fiscal responsibility, lower taxes and lower levels than the current government intervention in the economy. Indeed, many of them supported Candidate Obama because they disliked the Bush Administration’s high-spending, over-regulating policies. It seemed to independents that Candidate Obama promised new leadership and a new direction for Washington. Many independents have been shocked and dismayed by the Obama Administration’s move to the left. But they could have supported this surprise if there wasn’t such a lack of new-era leadership. For example, as an independent, I expected President Obama to be liberal. I closely read The Audacity of Hope (affiliate link) before the election and I was clear that he would govern from the left. But I also thought he would bring a new brand of leadership — a fresh, charismatic, Generation-X-style emphasis on American growth and vibrancy rather than old-line Washington politics. Unfortunately for all Americans (left, right and independent), that did not occur. Many independents feel abandoned by President Obama less for his liberalism than for his return to “Washington politics as usual.” This shift occurred within days of inauguration, and his popularity among independents has consistently fallen ever since. We live in an era where the key to winning elections is to combine support from your base (liberal or conservative) with the support of independents. This is true nationally and in most locales as well. For Democrats, who will get the bulk of Democratic votes no matter what, the goal right now should be to bring in independents by pushing through many tax breaks and finding ways to deregulate business requirements. When asked who they will vote for in the 2010 Congressional election, 62 percent of registered independents said they support Republicans; 30 percent plan to vote Democrats. This is a huge split in American politics, where voting differences are usually 1-3 percentage points and a 6 percent split is a landslide. As a result, many current Democratic candidates are frequently using the phrase “I’m independent.” As the election season kicked off right after Labor Day, the Obama Administration changed its message —apparently to attract independent voters. President Obama said in his speech on September 8th that it is American business which drives the economy, and Timothy Geitner said the same day that American businesses are very innovative and able. This change is a good move for the administration, but President Obama still managed to include disparaging remarks about privatization and Wall Street. Despite the fact that there may be truth to what he says, it is the tone of anti-business that reverberates. He may get past this bias in the weeks and months ahead, but will it last after the election? From an independent perspective, it doesn’t seem like it. Business really does drive the economy, and we need to genuinely embrace and support this. Independents are tired of the constant attacking between parties. Instead of Republicans attacking President Obama and the White House attacking Republicans, why can’t either just get serious about enacting policies that actually help small business? Our leaders must find ways to significantly help business. Proposed tax cuts for small business, payroll tax holidays, and not taxing research and development are good starts with bipartisan support. The Obama Administration deserves praise for these proposals. But a lot more is needed. If the government is going to spend money regardless of what the voters want, the current push to spend it on infrastructure is probably the best plan. Still, spending $50 billion of taxpayer money is quite an expense. And nearly all infrastructure contracts will go to big firms, further excluding and in places even hurting many small businesses. Unless private business is convinced to rebuild the economy, one business at a time, government spending will just make the problem worse. Harvard economist Niall Ferguson responded to President Obama’s new plan by pointing out that the $50 billion of infrastructure expenditures will do little or nothing to boost the economy since the plan is built on faulty economic reasoning that is good for politics but bad for the economy. In contrast, Ferguson argues, we should be studying how Reagan and Thatcher successfully battled and overcame major recession in both the U.S. and Britain in the 1980s. Even experts from left agree that the proposed Obama plan won’t do much to help the economy. President Obama’s speech included numerous jabs against Republicans, which many independents agree with. But it didn’t include much that could really help the economy. This has many independents frustrated. It feels too much like more politics, not better leadership. For example, the proposal to put freezes on non-security spending is a good idea, but it rang hollow, sounding more like a political debating point than something the president really cares about. If he gave it the same support as health care, and kept pushing it with tenacity and refusals to give up on the idea, many independents would be impressed. Instead, it seemed to come across like the right thing to say in this election season, but prone to be ignored in favor of big government spending after the election. If that isn’t true, if the Obama Administration really does follow through on this proposed freeze on the non-essentials, many independents will swing back to supporting President Obama. But I think that most independents will wait until after the election to see if this happens. The president’s speech was excellent in many ways, and independents should be glad that he is now saying some of the right things. It felt like the return of Candidate Obama. But therein is the problem. Is it just campaign rhetoric? The contrast between Obama’s campaign persona and his Head Democrat persona is so dazzling that it’s more challenging than usual to hope that Mr. President will lead out. And why did he say a lot of the right things about fiscal responsibility but only get passionate when he was criticizing Republicans or talking about increased government spending? The Democratic narrative seems to be that without the stimulus the recession would have been much worse. But many independents don’t buy it. They didn’t like many of President Bush’s policies, but they are just as frustrated with the current administration’s strategies. They believe the stimulus was a flop and healthcare and other massive regulations have seriously hurt the economy. They blame both Obama and Bush for the current economic mess. But since Bush is out of the discussion, their frustration is pointed at President Obama. American independents aren’t the only ones who feel that the Obama Administration’s stimulus and massive spending/regulating strategy has worsened the economy. If the plan is to spend more, tax more and increase regulations, then I agree — let the politicians sit on their hands and do nothing! But what if, instead, they cut taxes, deregulated small business, changed the healthcare law to incentivize business investment, and extended an olive branch of friendship and thanks (yes, genuine gratitude) to entrepreneurs and business for their vital contributions to our prosperity? Doing nothing, as good as it may sound to Tea Partiers and some independents, is not enough. Washington needs to reverse the bad-for-business policies accumulated since 1987 — or at least during the Bush/Obama growth of anti-business policy since 2001. If this sounds impossible, we may be in for a very long period of economic struggles. In Conclusion: It’s the Economy! The future of the economy depends on the willingness of small business to take risks and the willingness of big business to hire, spend and invest. Until our national leaders are willing to cut government spending, lower taxes, reduce government interventions in almost every sector of business, and show more genuine friendliness to business, our economic problems will continue. Whatever the results of the 2010 election, Washington has got to make friends with business. We simply must make those who spend their lives in business feel safe and excited about building, hiring, investing, growing and spending. Otherwise, deepening economic troubles are ahead. We desperately need real leadership in Washington, leadership which will actually incentivize, promote and reboot the economy. The best-case scenario would be for the Obama Administration to lead out in this direction. After all, they’ll be in the White House for at least the next two years. This pro-business outline (cut taxes, significantly reduce regulation on business, get government spending under control, and make friends with business) should be the guiding principle to every voter in every election across the nation this year. We need to pay little or no attention to political party and instead elect leaders who will help kick-start, encourage, and stimulate the economy. This is a true mandate, and our national future depends on it. More and more people think so. The current presidential administration makes periodic claims that we are in an economic recovery, but at the same time growth is still slowing and unemployment figures stay around ten percent. With more American deaths in Afghanistan during the last week of July than any week to date, things seem to be deteriorating at home and abroad. To make matters worse, few people believe that the opposing Republican Party has much more to offer than the Democrats. With neither side poised to really fix things, few Americans have a lot of hope for the future of government leadership. Here a few of the issues vexing citizens. First, even though many politicians have been claiming that we are experiencing an economic recovery, it doesn’t feel like it to most Americans. The Obama White House doesn’t seem very friendly to small business. Most of the entrepreneurs and businesses who do hold cash aren’t about to hire or expand in an environment where their taxes and regulatory burden could be increased at any point by an unfriendly Administration. Ironically, Washington is responding by promising to increase taxes and regulations. Understandably, those who hire are skittish. Treasury Secretary Timothy Giethner said in July that we’ve reached a point where private hiring—rather than government spending—is the answer to economic growth. But until the government starts supporting small business, and as long as it refuses to incentivize free enterprise, the economy will struggle. Author Arthur Brooks argues that the nation is 70% in favor of free enterprise and about 30% opposed, but that the 30% are in charge. The 30% has gained much influence over citizens by convincing them that it was private business that caused the recession in the first place. Somehow, this view has successfully convinced much of the public that the Bush Administration, big banks, Wall Street and all small businesses are the same group. Those who read the fine print, however, are clear that policies from the Clinton and Bush Administrations led to the mortgage crisis. Moreover, big government and big business together caused the recession. In the meantime, both ignored small business and continue to do so. As a result, the 70% is confused and unable to keep the 30% in check. So more government policies hurt the economy and make it unwise or unfeasible for small businesses to hire and grow. In the meantime, much of the Right is busy labeling Democrats as “socialists” rather than helping incentivize growth and prosperity. Both sides seem to mean well, but one has unbounded faith in government and the other is preoccupied attacking that faith. While the two sides posture, the plight of small business is sometimes discussed but remains unaided. Second, this problem is deeper than most people realize. Since World War II, the United States has promoted a mixture of free enterprise and big government. In history, societies typically emphasized one or the other. When big government ruled, enterprise was highly regulated and taxed; where free enterprise was the focus, taxes were small, regulations were minimal, and governments were limited in size, scope and budget. And to nearly all Americans, “doing something” means increasing government action to benefit the pet cause or regional constituency. If President Obama doesn’t pass much of his agenda, his political friends and competitors alike will label him ineffective. Americans in general want their politicians to do a lot and are disappointed when officials fail in this. The irony of the American voter is that “doing a lot” immediately earns most politicians a place on the voters’ list of officials to vote out. Americans today want the impossible: low taxes and lots of government programs. In the end, the question of whether a country is governable turns on how much government you think it needs. America’s founders injected suspicion of government not only into the constitution but also into the political DNA of its people. And even in the teeth of today’s economic woes, at least as many Americans seem to think that what ails them is too much government, not too little. Americans must either choose big government and be willing to pay for and submit to it, or they must move toward smaller, less intrusive government and be willing to enjoy fewer government programs. When voters want the prosperity of freedom along with the bread and circuses of massive government, every election is a referendum on incumbents. Eventually, though (and the day of reckoning appears to be close on the horizon), something will have to give. Unfortunately, few societies make such hard choices until they are forced upon them by war, depression, pandemic or other major crises. Sadly, few nations have the leadership or the fortitude to adopt the simple solution of spurring major growth and prosperity by de-regulating, de-taxing and freeing up the economy. Freedom works, but few in history have been willing to adopt it. We are unable to overcome these and many of our deepest challenges because of the way we distribute leadership in our society. The American founders envisioned a truly great educational system, built around schools in every locale, to train their youth in the great ideas of mankind’s history, as well as the latest practical arts and sciences. 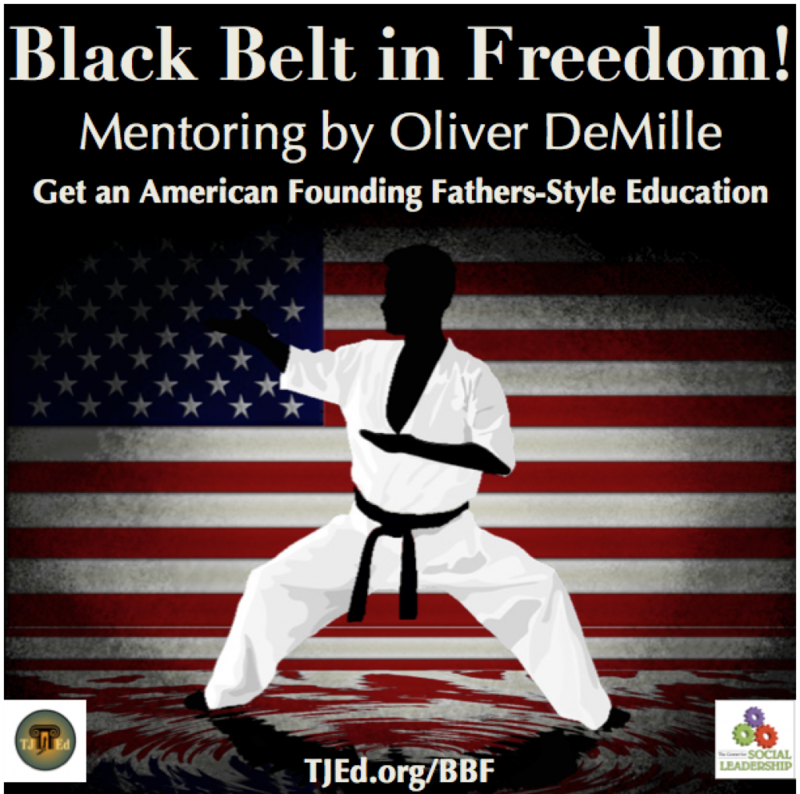 They built the early American schools to train empowered citizens who would protect freedom, foster prosperity, leadership, and character in all walks of American life. They wanted an educational system that prepared their youth to become effective in their families, communities, and careers. This vision helped create a nation that by 1946 produced over half of the world’s goods and services with only 6% of the globe’s population. Freedom works, and the success of the American constitutional-free-enterprise model was spectacular. In the process, this system over time addressed, and — in some cases, even began to resolve its biggest negatives, including slavery and other inequities. Unfortunately, by the late 1930s, the citizens and leaders who built this great model of success, freedom, and prosperity sent their children and grandchildren to schools which rejected this system, and instead adopted a new style of education focused mostly on career training. Sadly, these American schools established by the our founders were replaced after World War II by the German model which was based on socio-economic class divisions. In the “new” system, the elites still received leadership education (like all citizens had before 1939) while the middle and lower classes were educated only for jobs. As this system grew, a Germanic-style grading system reinforced class-society advancements among the youth. The maladies of credentialism, class divisions, and reliance on experts made their way into mainstream American culture. From 1939 to 1979, these contagions grew and infected the Founders’ classless and “free American” vision. In such a system, the motto was: “A students work for B students.” The concept of “The Company Man” spread and Americans became addicted to big institutions. Freedom and entrepreneurial values gave way to competing for executive positions and benefits packages. The goal of employeeship replaced the American dream. Career became the purpose of schooling in almost everyone’s mind, and ownership and leadership values begin to literally disappear. Eventually big institutions became truly massive, and anything except employeeship was considered inferior and backward. In this environment, young people with a sense of leadership, idealism and ambitions to make a great impact on society split between the Left and the Right. Those coming from traditionally conservative families tended toward majors and careers in business, while youth from more liberal backgrounds leaned towards the media and legal professions. Most of today’s national leaders were part of this split. The Reagan era ushered in a revolution of support for and promotion of free enterprise ideas and values. Numerous non-traditional business models (like multi-level and network marketing) put individuals at the center of building a personal business rather than working as an employee, and eventually non-traditional educational options (from private and charter to home and online opportunities) grew in popularity. Employeeship was still the dominant view, but a rising minority embraced the freedoms and prosperity of entrepreneurship. The dot.com boom and Roaring 90’s soon followed, and the entrepreneurial sector slowly grew. Note that “those who cared little for grades and a lot about learning” often come from non-traditional private, charter, home and online learners, as well as from immigrants who are leading in entrepreneurial successes. And more than a few come from the traditional schools. Since small business accounts for 80% of America’s economic growth, this is a significant development. Unfortunately, the number of people in the entrepreneurial sector is still very small. Whether purposely or as a side effect, we are still training the overwhelming majority of our youth to believe that being A students means getting a good job and that employeeship is the greatest goal for education and even lifestyle. Perhaps even more disturbing is that most of our Idealistic youth with ambitions to improve the world are still going after jobs in big business or big government. The thing is, working for a big corporation or in a government job are unlikely places to really make a positive difference in the world. We are distributing leadership in the way aristocratic and socialistic societies always have, and the future will unfold accordingly unless something changes. We desperately need a rebirth of the entrepreneurial ideal. Unfortunately, it’s not just the schools and universities that are continuing this outdated focus on jobs as the end-all of education and life. Movies and television often demonize entrepreneurs while dedicating most of their time to stories about employees. Full-time sports channels seem to dedicate as much time to the business side of athletes as to the entertainment, making sports role models as valued for their lucrative contracts as for their abilities on the playing field. Even elected officials more typically refer to their role as a job than as public service. Recent administrations and the media have referred to the constitutionally-titled commander in chief as the nation’s CEO. There are many other examples. Because the “job-is-life” view is so prevalent, it has even become normal for successful entrepreneurs to see their work as done as soon as they can live comfortably. In earlier generations (those that built and maintained American freedom), such successful entrepreneurs considered it their duty to spend the second half of their life helping society greatly improve. Perhaps only parents and community leaders can effectively counter this trend and help more youth who want to help improve the world seek a true leadership education and seriously consider engaging in entrepreneurial careers. So, to answer our question, yes, government is broken. The break is repairable, but it will take some major work and effort on the part of this generation. When freedom is decreasing through constantly increasing regulations, government is broken. When the free enterprise system is under attack from our own government, government is broken. When a tenth of our working society can’t get a job, and when the government responds by increasing taxes and regulations on those who could provide the jobs if they were free to do so, government is broken. When two parties hold a monopoly on government, and where both increase spending and regulation no matter who is in office, government is broken. But all of this misses the real point. When most of society seeks employeeship above all else and every facet of life revolves around employeeship, much more than government is going to be broken. Employeeship certainly has a place in effective nations, but it should be prioritized behind things like family leadership, citizenship, and private ownership. Another name for these is life, liberty and the pursuit of happiness (or alternatively, as Jefferson originally wrote, “life, liberty and property”). In the 2008 election President Obama was supported by the Left (who loved his promises of economic liberalism), but he was elected by independents who saw in him a possible end to the corruption of the Bush years and a potentially great leader for the United States. The “Leadership Thing” swept him into office. Now, the Obama Administration could greatly boost the economy by deeply promoting entrepreneurship—both symbolically and in reduced taxes and regulations. Such incentives would spur more hiring, investment and expansion, and a recovery would follow that Americans could really believe in. In fact, the President could probably accomplish this without changing any policy at all, simply by warming to small business and genuinely becoming friendly to entrepreneurs. An old advertising proverb says that people make choices emotionally and then use logic to defend it. No matter what Washington says, and no matter what the economic numbers show, most entrepreneurs are unlikely to increase jobs and boost the economy through investments as long as they think the man in the White House basically dislikes and mistrusts them. Even liberal-leaning businessmen are worried that the President isn’t supportive. The White House could drastically help the recovery simply by changing its bias against small business. If this is just a perceived dislike of business, not a real one, they can simply change their message. If, on the other hand, the Administration really does mistrust or dislike small business, it should reconsider. After all, unlike Wall Street, big banks and big corporations, small business simply cannot be blamed for America’s economic challenges. It has been the victim of the mistakes made by both big business and past government. Yet it keeps plugging along, keeping the recession from being much worse. And small business certainly is the group most likely to overcome high unemployment. Indeed, when the economy does make a serious comeback, entrepreneurs will be leading the way. Hopefully, the Obama Administration will extend its “Yes, We Can” philosophy to those who have the most potential to drastically grow our economy. It is time for all Americans—from the White House to our individual living rooms—to pour out a deep, genuine and heartfelt admiration and “thank you” to those who run small businesses. Whatever the politicians of any party do, the greatest need is for parents, grandparents and all of us to rekindle an excitement for entrepreneurship in the youth. The future of America’s freedom and prosperity may well depend on it. As long as free enterprise isn’t flourishing, our government will be broken.